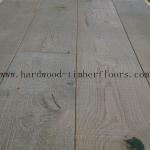 Wire brushed & hand scraped hardwood flooring or engineered wide plank hardwood flooring comes in a wide range of styles ,the flooring designs are greatly favorited particular in Europe,Canada and Australia market. 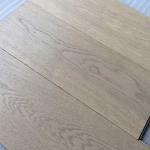 Among all the wood species ,oak is a prominent wood material to be processed as the various Wire brushed & Hand scraped hardwood flooring.Both solid 18mm & engineered wood 15mm are availlabl from C&L hardwood. 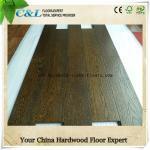 The coating is UV or white oiled to clearly present the natural wood grains. The construction of the engineered wide plank floor is in 3 ply ,Multi ply or even HDF base with 5" ,6",7" or 8" width saw cut 3.0-6.0 mm top which is a standard for Europe countries. Wire brushed wood flooring surface is considered more dust or scratch resistant comparing with normal smooth UV finished flooring as this surface is easier to be cleaned. Except above oak feaures,C&L hardwood supply also Manchurian Ash, Mongolian Teak,Chinese Oak etc wood species in other different stains.